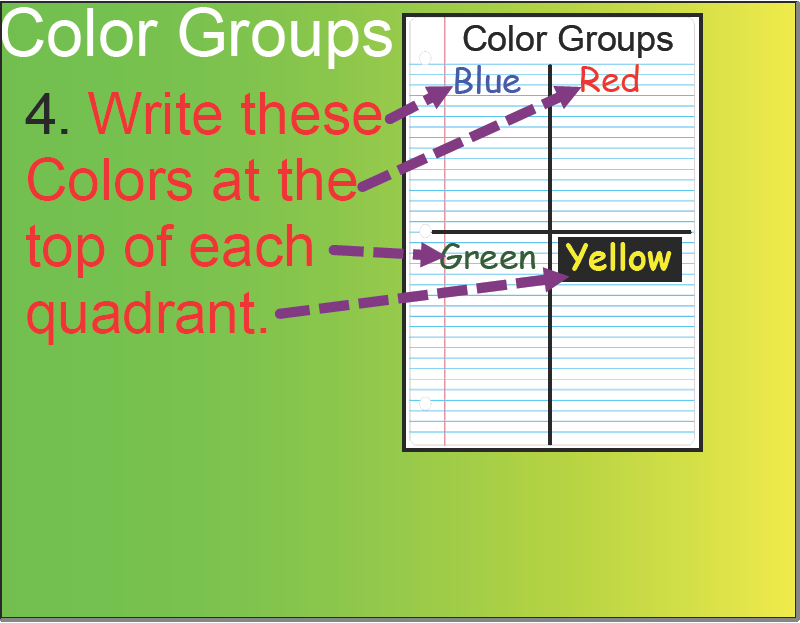 The embedded images below are exported from a SmartBoard presentation that we implement toward the beginning of the school year. 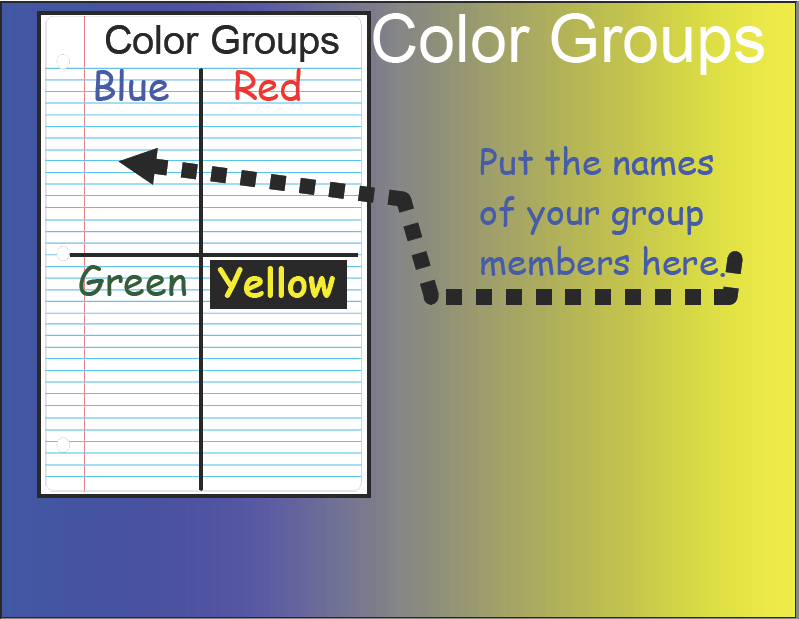 The idea is to have students form four groups that are totally different from one another (no repeat members between groups). 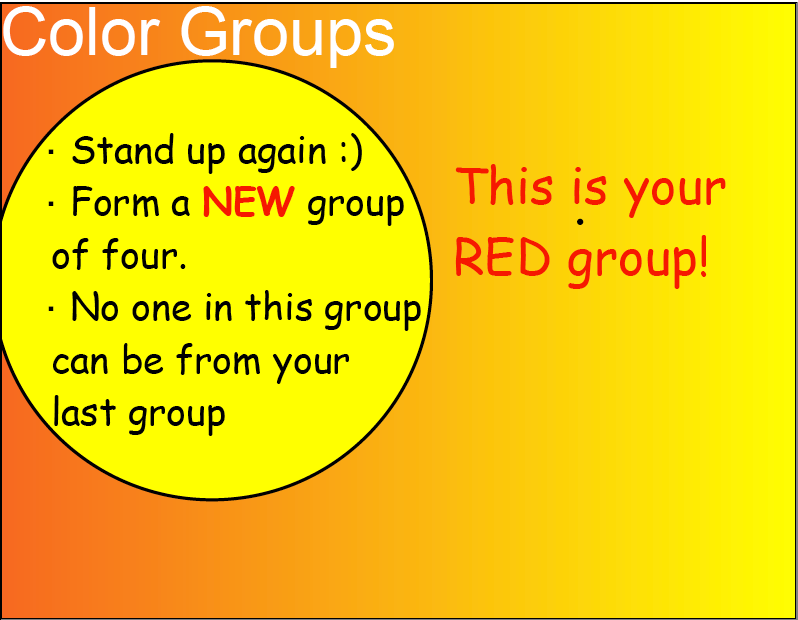 We then use these groups throughout the semester when working on cooperative group assignments. 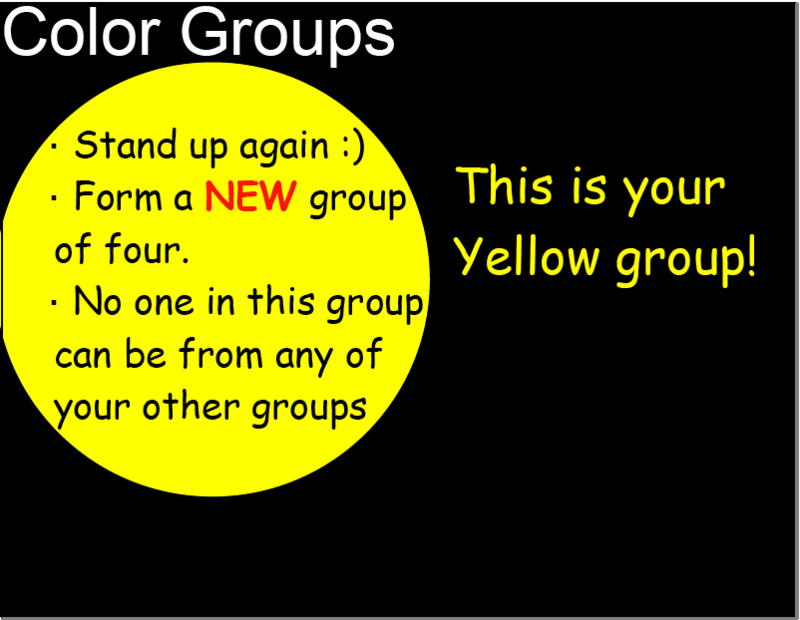 Formation of these groups is student led, helping students to “break the ice” early in the year while also introducing them to the active decision role they will be expected to take throughout the semester. 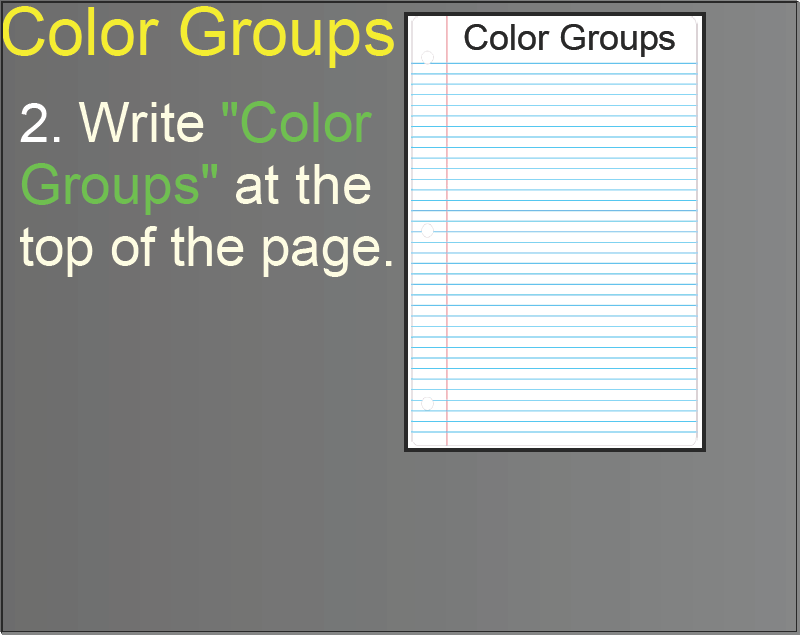 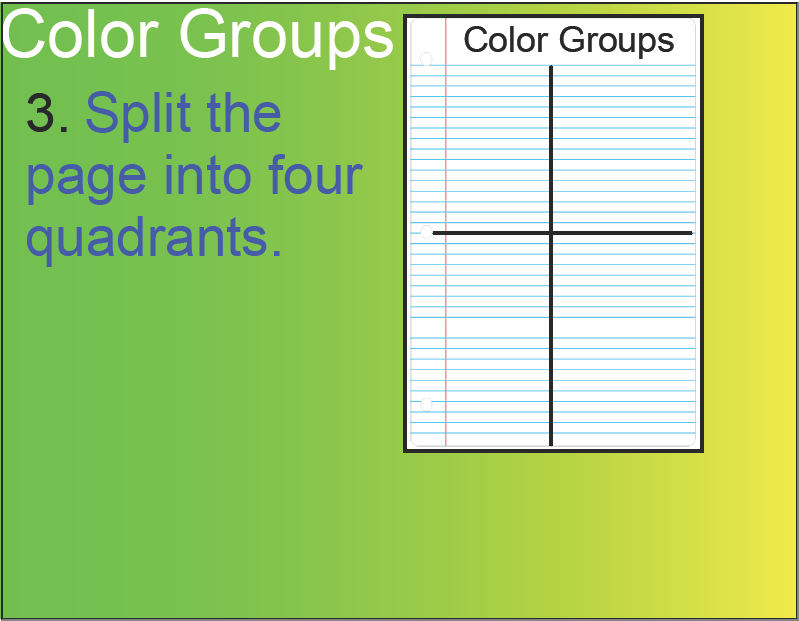 Using this format to create groups ensures that students will have four different groups, all composed of completely different members. 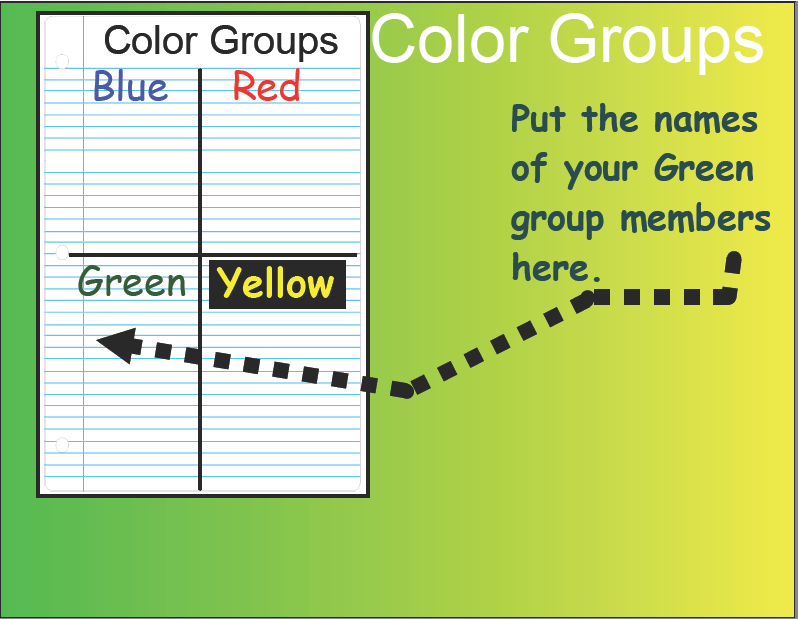 This keeps things interesting and also allows students to become familiar with more students in the class than they otherwise might choose to do. 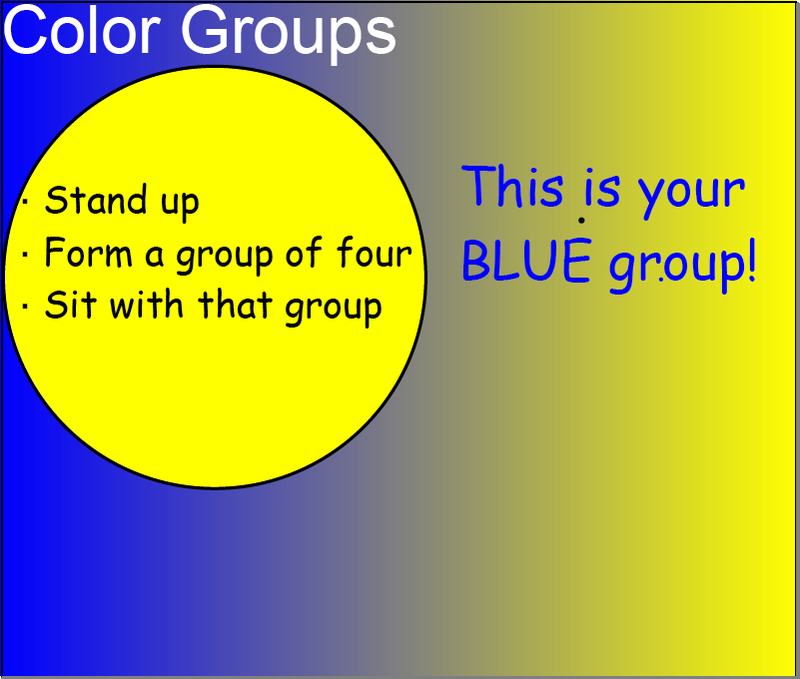 Blue groups tend to be very homogeneous groups because they are the first groups the students get to form, thus they tend to group up with all their best friends. 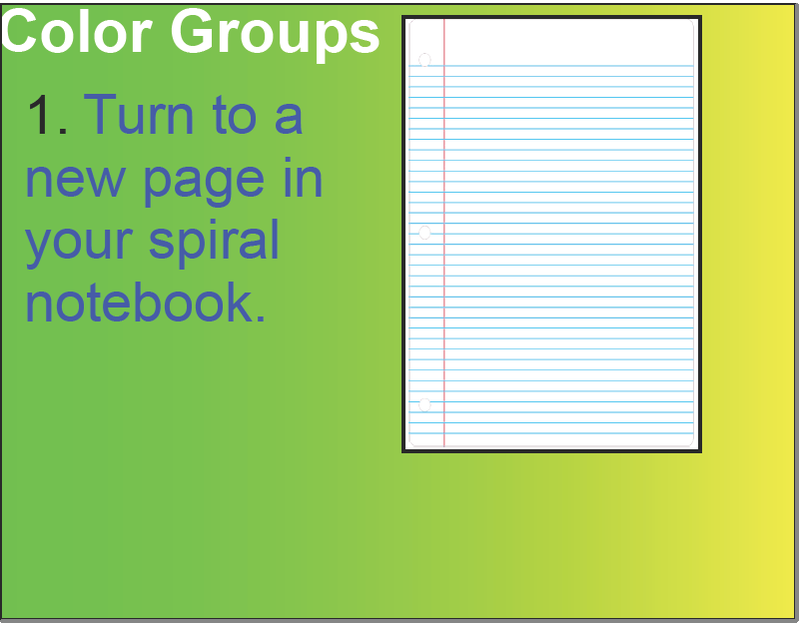 We like to have students get into these groups when the activity lends well to groups that have similar abilities, interests, and good rapport with one another. 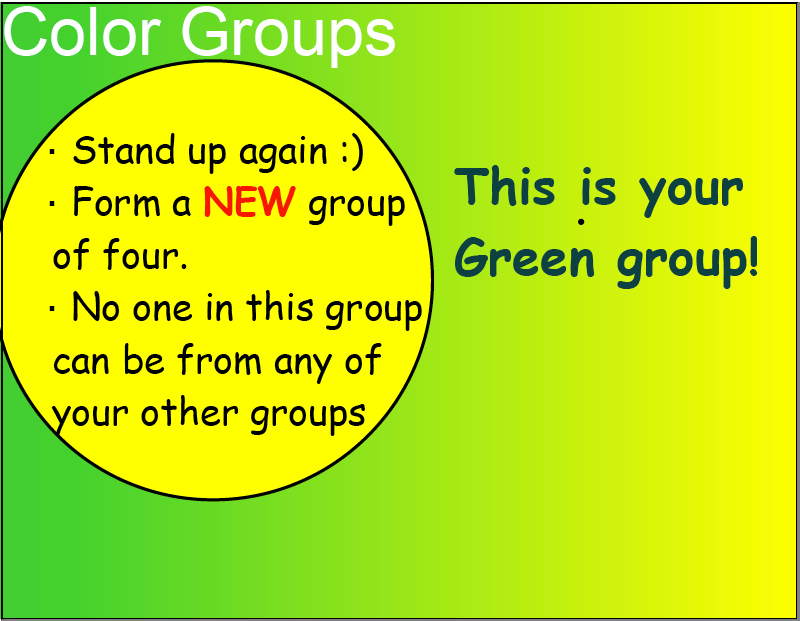 With each progressive group (Red then Green then Yellow), the groups get more heterogeneous. 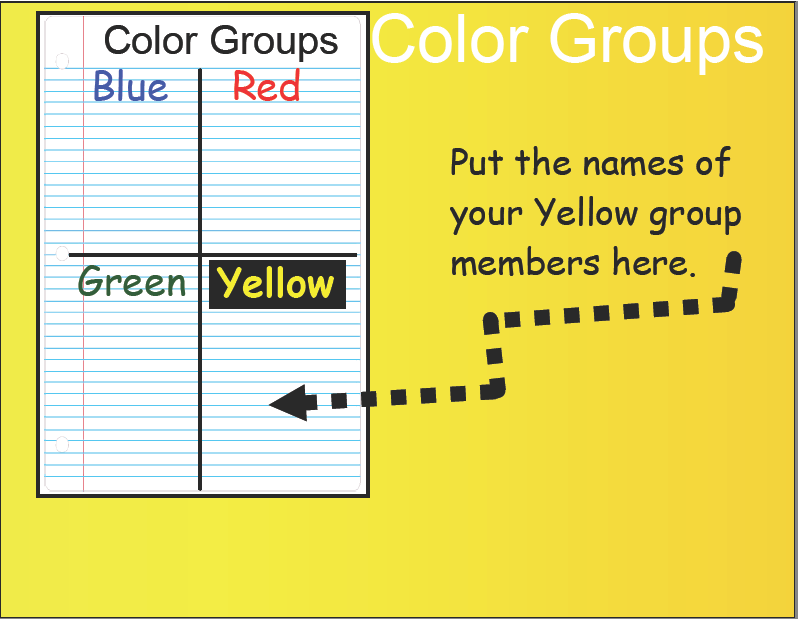 This lends well for activities where multiple perspectives, abilities, and approaches to the work are desired. 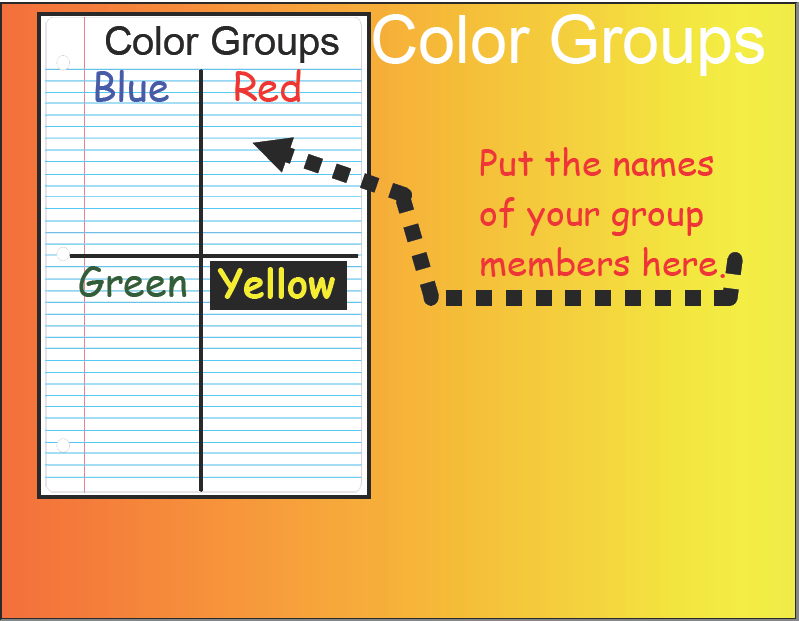 We find that in certain situations, getting students out of their “comfort zone” produces some really great conversations and idea representations.